The South Pole Telescope (SPT) is a 10 meter (394 in) diameter telescope located at the Amundsen-Scott South Pole Station, Antarctica. It is a microwave/millimeter-wave telescope that observes in a frequency range between 70 and 300 GHz. 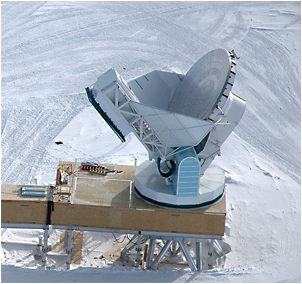 The South Pole Telescope (SPT) is a 10-meter telescope at the Amundsen-Scott South Pole research station. Taking advantage of the exceptionally clear, dry, and stable atmosphere at the South Pole, the SPT will map large areas of the sky with high sensitivity at millimeter and sub-millimeter wavelengths. Virtually visit the South Pole Telescope and the Amundsen-Scott South Pole Station, which is operated by the National Science foundation via panoramic in Google Street View format. The initial goal of the SPT was to explore the nature of dark energy, an unexplained phenomenon responsible for the observed acceleration in the expansion of the universe. The SPT will search for massive clusters of galaxies by looking for spectral distortions in the cosmic microwave background. Dark energy inhibits the growth of galaxy clusters, so studying the population of clusters through cosmic time will constrain models of dark energy. With the installation of the polarization sensitive SPTpol detector, SPT began a program of searching for B-mode polarization in the CMB. During the 2016-17 austral summer, SPT's focal plane has once again been updated with the SPT-3G instrument which will significantly increase its sensitivity as it searches for B-modes in the microwave sky. This research is a collaboration among nine U.S. and Canadian institutions. KICP Workshop, Workshop: "Astrophysics with the CMB-S4 Survey"
KICP Lecture, 88nd Compton Lectures: Amy Lowitz, "Nuts and Bolts Cosmology"
PhD Thesis Defense, Alessandro Manzotti, "Unveiling the early Universe: delensing the Cosmic Microwave Background with galaxy surveys"
PhD Thesis Defense, Kyle Story, "Measuring the Temperature Anisotropy and Gravitational Lensing of the Cosmic Microwave Background with the South Pole Telescope"
PhD Thesis Defense, Abigail Crites: "A Measurement of the Cosmic Microwave Background Polarization with SPTpol"
KICP Event, Interview with John Carlstrom, "Witnessing Starbursts in the Early Universe"
KICP Talk, John Carlstrom, "Exploring the Universe from the Bottom of the World"
KICP Lecture, John Carlstrom, "Exploring the Universe from the Bottom of the World"
PhD Thesis Defense, Ryan Keisler, "Measurements of Cosmic Microwave Background Anisotropy with the South Pole Telescope"
KICP Talk, Cafe Scientifique: Tom Crawford, "Cosmic Road Trip: From Chicago to the South Pole to Edge of the Universe"
PhD Thesis Defense, Joaquin D. Vieira, "Extragalactic point source statistics measured with the South Pole Telescope"
KICP Lecture, John Carlstrom, "The South Pole Telescope"